Youth Salute is a national program created to recognize youth and their achievements. 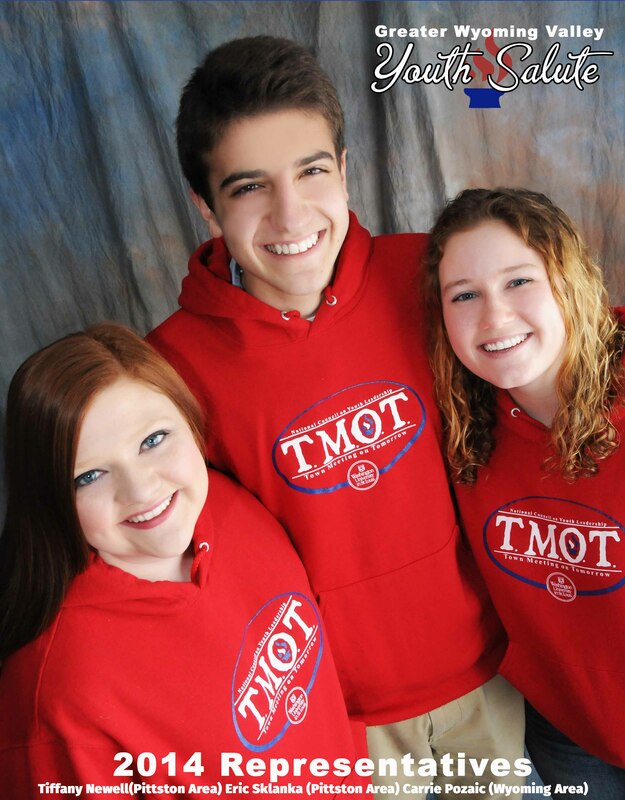 NCYL, Youth Salute is a non-profit program headquartered in St. Louis honoring youth leaders since 1976. Youth Salute conducts the nationals in cooperation with Washington University in St. Louis. On a local level over 4000 students have been recognized in the Greater Wyoming Valley. Our Motto “Recognizing and Applauding Today’s Youth”. How do Youth Salute nominees get recognized? Youth Salute nominees are also recognized at our yearly awards ceremony. All nominees are invited to attend and are awarded their certificates and the Youth Leaders of the area are given recognition and some may receive scholarships. The top Youth Leader of the year is awarded a fully paid round trip to represent the Greater Wyoming Valley at the Nationals (Town meeting on Tomorrow) in St. Louis, and a chance to compete for scholarship money. How does Youth Salute work? A student meeting the Youth Salute criteria may be nominated, by your guidance counselor, principal, teacher, community leaders, etc. The Application can be obtained from your guidance counselor or our website. Once a student has been accepted as a nominee, nominees will then be scheduled for a photographic session that will include 4 different outfits. The nominees can bring props or items that pertain to their accomplishments. Parents are required to accompany the nominees to their session . At this time nominees will also be given a form to fill out with their profile information. All Images and profile info must be complete by July 15, 2014, in order for the panels to be ready for their tour. (The tour starts in late August.) Following this, the display panel is created and is scheduled for tour at set locations. This is a year long program and may continue from January to November. In September The Greater Wyoming Valley will hold it’s Youth Salute Awards Program to honor the nominees and announce the local youth leaders. What does it cost to be in Youth Salute? There is no cost to be a Youth Salute nominee. Youth Salute nominees are offered a chance to purchase the profile display at parents discretion. Some parents choose to purchase the display as a keepsake, some do not. There is no obligation whatsoever to purchase the display. This program is not based on selling the nominees display, but it is based on foremost recognizing the nominees. Youth Salute is a not for profit program and is sponsored by businesses throughout the community that are interested in recognizing our youth, our leaders. All awards, banquet, paraphernalia, advertising, trips, etc.. are all donated by businesses throughout the Luzerne County. If you are a person or business owner who is interested in becoming a sponsor, please contact us for more info. Who can be recognized by Youth Salute? High school juniors with a 3.0 GPA or above and involved in several or many activities (high achievers), including, but not limited to: school, religious activities and or community. Students must show proof of GPA on application through verification from their school guidance counselor.